Join GAC as we simultaneously read to over 500 third graders in the East Chicago & Gary School Corporations! 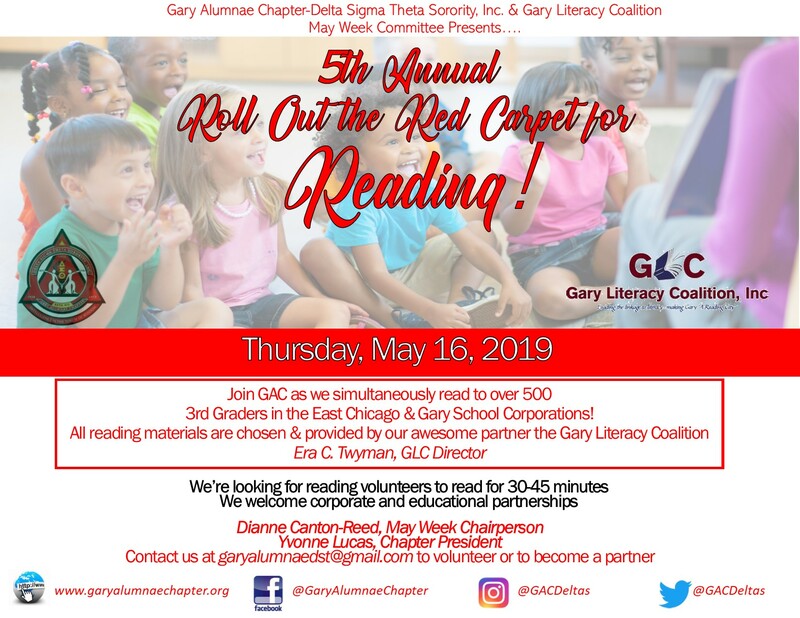 The reading materials are chosen and provided by our awesome partner The Gary Literary Coalition- Era C. Twyman, Director. Would you like to volunteer to read or know someone who would love to read? Please email May Week Chair, Dianne Canton-Reed @ garyalumnaedst@gmail.com TODAY! We also welcome corporate and educational partnerships. Reading is only for 30-45 minutes (depending on the attention spans) and the more creative you are with your attire and reading, the better the experience is for the child. Why is third grade so important to a child’s educational development? To start, third grade is the transitional year when a child moves from learning to read – using their knowledge of the alphabet to identifying words – to reading to learn or using books as a source of information. We want to send a message to students, schools and lawmakers that READING is fundamental! *May Week is a national program of Delta Sigma Theta Sorority, Inc. that was created in 1920. A week in May is set aside for programs highlighting academic and professional achievements and the events emphasize the importance of higher education in the community, especially for black women. The GAC May Week Committee Chairperson is Dianne Canton-Reed.